In order to build lean muscles and perform well in your exercises and sports, you need to supply your body with enough nutrients. This is not only about the number of calories that you daily consume, but also whether you are getting enough vitamins and minerals. In order to fulfill your daily nutritional requirement, you can take a multi-vitamin/ multi-mineral supplement. 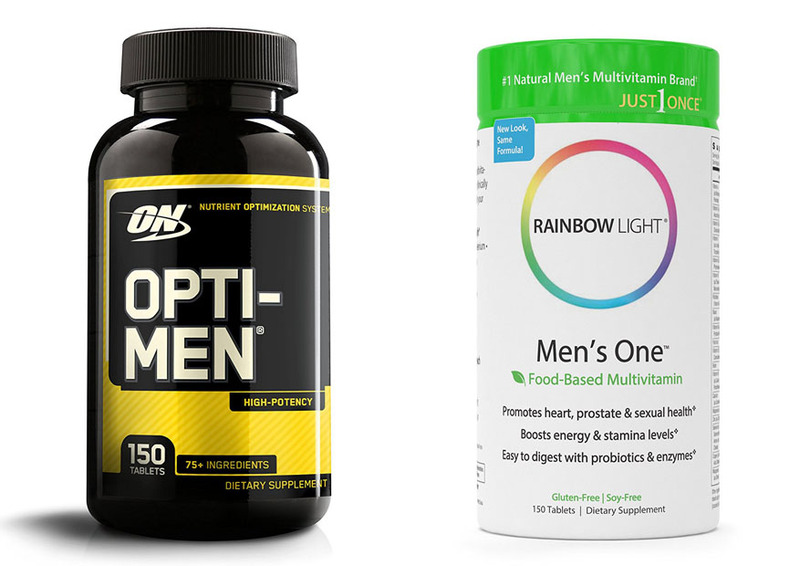 Two of the most popular products for men on the market right now are Optimum Nutrition Opti Men and Rainbow Light Men’s One. Below, we will see the comparisons between Opti Men vs Rainbow Light to help you decide the best daily supplement to take. First of all, let’s compare the nutritional values of Opti Men and Rainbow Light. If we carefully compare their levels of vitamins and minerals, we can see that Opti Men is generally the superior product. It provides higher levels of vitamins and minerals per serving. Each serving gives you 10,000 IU vitamin A, 300 mg vitamin C, 1,500 IU vitamin D, 200 IU vitamin E, and 75 mcg vitamin K. Furthermore, each serving gives 300 mcg biotin, 600 mcg folic acid, vitamins Bs, as well as various minerals. See also: Opti Men vs One A Day. On the other hand, the levels of vitamins and minerals in each serving of Rainbow Light are generally lower. It provides 5,000 IU vitamin A, 120 mcg vitamin C, 800 IU vitamin D, 30 IU vitamin E, 100 mcg vitamin K, 150 mcg biotin, and 800 mcg folic acid. It also contains vitamins Bs and minerals. Even so, Rainbow Light is enriched with higher levels of choline, inositol, and lycopene. Both Opti Men and Rainbow Light are enhanced with several additional blends to support your body. They both have digestive enzymes that can aid in the digestion process. They also have green and vegetable blends, although Opti Men notably comes with many more varieties of greens and vegetables. In addition, Opti Men also comes with the Amino Men Blend, which contains a number of amino acids which are essential for building and repairing muscle tissue. The next difference between Opti Menvs Rainbow Light is the serving size. With Opti Men, you have to be more committed and diligent. You will have to take three tablets daily with food. For someone who is very busy, having to take three tablets daily may be a little inconvenient. Rainbow Light is more convenient. After all, it has been designed for active and busy people. It only requires you to take one tablet per day. You can take the serving in the morning when you are having your breakfast before going to work. In general, Opti Men is more recommended because it comes with higher vitamins and minerals. In addition, it is enhanced with more blends that can benefit your body – the amino acid blend is especially useful if you want to build lean muscles. On the other hand, Rainbow Light is not the best choice if you want to build lean muscles or improve your performance, but this is a good supplement for active and busy people.